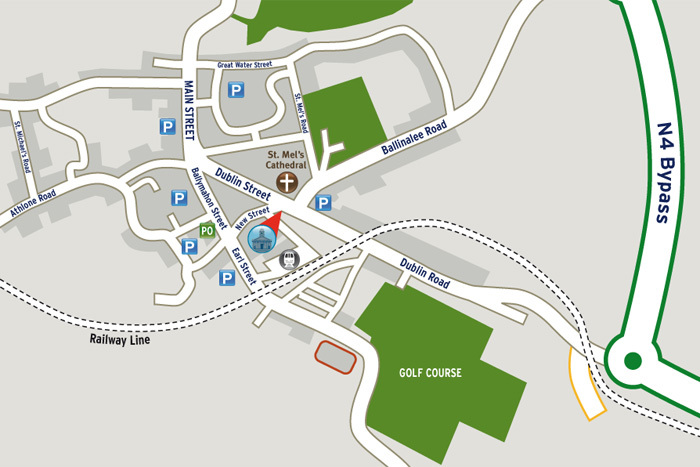 The Cathedral View Apartments are located in Longford Town in the heart of Ireland. The listed buildings are in the elegant surroundings of Keon’s Terrace, on the Dublin Road, opposite St Mel’s Cathedral. Longford lies at a meeting of the N4 and N5 primary roads which lead to many of the major towns and cities of Ireland. The Cathedral View Apartments are a 5 minute walk from Longford Bus and Train Station, approximately 1.5 hours from Dublin Airport and 1 hour from Knock Airport. Approaching Longford on the N4, take the first exit at the ‘Padraic Colum Roundabout’ and continue towards Longford Town. Proceed through the traffic lights, under a railway bridge and you will notice the copper dome of St Mel’s Cathedral coming into view. Advance with care as you pass a national school on your left. Directly after the school is the gated entrance to the apartments, which is visibly signposted “The Cathedral View Apartments”. Welcome to your destination. Approaching Longford on the N4 from Sligo, you will reach the ‘Red Cow Roundabout’, take the third exit into Longford. Proceed down ‘The Battery Road’, into Longford Town. Drive through the town, following the one way street system which will bring you onto Dublin Street. At the end of Dublin Street, St Mel’s Cathedral sits majestically on your left. You will proceed straight through the traffic lights, with a colourful Victorian Terrace on your right. This is the front of the Cathedral View Apartments. The gated entrance is at the end of the terrace. You have arrived. Approaching Longford Town from Athlone on the N63, the one way traffic system brings you to The Market Square. Keep to the left, approaching a junction at “The Market Bar”. Turn left onto Ballymahon Street, merging to the far right lane. You reach a traffic light junction, following the road right onto Dublin Street. At the end of Dublin Street, St Mel’s Cathedral sits majestically on your left. You will proceed straight through the traffic lights, with a colourful Victorian Terrace on your right. This is the front of the Cathedral View Apartments. The gated entrance is at the end of the terrace. You have arrived. Longford Town (population circa 9,000) is one of the region’s key commercial and industrial centres, and serves a wide catchment area as the primary town in the north midlands region. It hosts all the major Irish banks and is a vibrant retail centre, with five of Ireland’s largest multiples located in the town. Longford has a proud sporting tradition and a wide range of sports and leisure clubs including GAA, rugby, soccer, swimming and tennis clubs and an 18-hole parkland golf course. It hosts one of the finest urban parks in the country at the Mall which apart from beautiful walks, has a 25m swimming pool, gymnasium, two playgrounds and all-weather sports facilities. The Backstage Theatre (capacity 220) is one of the premiere theatre venues outside Dublin, while the town also has a multiplex cinema, greyhound stadium, bowling alley, several children’s indoor activity centres and an array of award winning restaurants. St. Mel’s Cathedral in Longford Town, is an imposing 19th Century, Renaissance-style building of grey limestone. Its dome may be seen from quite a long way outside the town. St. Mel’s Church is located in Ardagh, a small picturesque village to the southeast of Longford Town. The church is said to have been founded by St. Patrick and is recognised as a national monument. Corlea Trackway Visitor Centre interprets an Iron Age bog road which was built in the year 148bc across the boglands close to the River Shannon. The oak road is the largest of its kind to have been uncovered in Europe and the interactive centre at Corlea contains an 18m stretch of preserved road. The Islands of Lough Ree, particularly Inchcleraun named after a sister of Queen Maeve and remembered in Irish mythology as the place where she was killed. On the island are the ruins of an early monastery, now a national monument, with remains of five churches and other buildings. The islands and the shoreline of Lough Ree are of particular importance as unique wildlife habitats for rare plants and invertebrates, mammals and migrating birds. Lanesborough is located on the River Shannon at the northern entrance to Lough Ree where County Longford borders County Roscommon. It is a very popular stop-over for pleasure boats and the area is famous for its sport fishing, with access to Pike, Perch, Brown Trout, Tench and Rudd, to name but a few. Abbeylara Village is home to a number of historical sites. The remains of a 13th Century Cistercian Abbey founded by the Anglo-Norman, Richard Tuite can be found beside the village. A semicircular earthwork north of the village is regarded locally as the site of the original church founded by St. Patrick about 460ad. In the parish there are two well preserved remains of stone circles along with surviving traces of what appear to be megalithic burials. Granard, a market town in the north of the county, which has a traceable history going back to 236ad. Granard is renowned for its motte, situated at the head of the town and built by Richard Tuite. County Longford has several other idyllic villages and towns including Ardagh—an architecturally renowned estate village and several times winner of the National Tidy Towns competition—Newtowncashel, also a winner of the National Tidy Towns competition, Abbeyshrule, Newtownforbes, Ballinalee, Kenagh, Clondra, Legan, and Drumlish, each with their own special character and each offer a quality of life that is long forgotten in many of the more developed counties around Ireland.